Just a brief note today, regarding reporters who are pointing to an economic and financial shift. 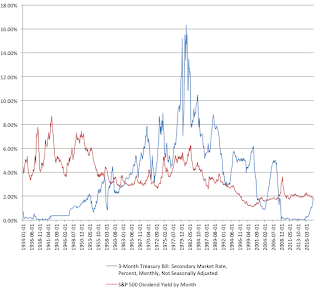 Extraordinarily low interest rates have had a significant impact on asset prices in Sonoma Valley (as I blogged about here, here, and here). In 2015, Robert Shiller pointed out that in the San Francisco Bay Area, that most people expected annual home price increases over the next decade of 5%. However, more than a quarter of respondents thought prices would increase each year by 10% or more. Many of the second group leveraged (and profited impressively) as real property prices have continued to rise over the intervening 36 months. Reserve Bank of St. Louis [FRED] May 15. 2018. May 15, 2018. Excel data and graph available here. 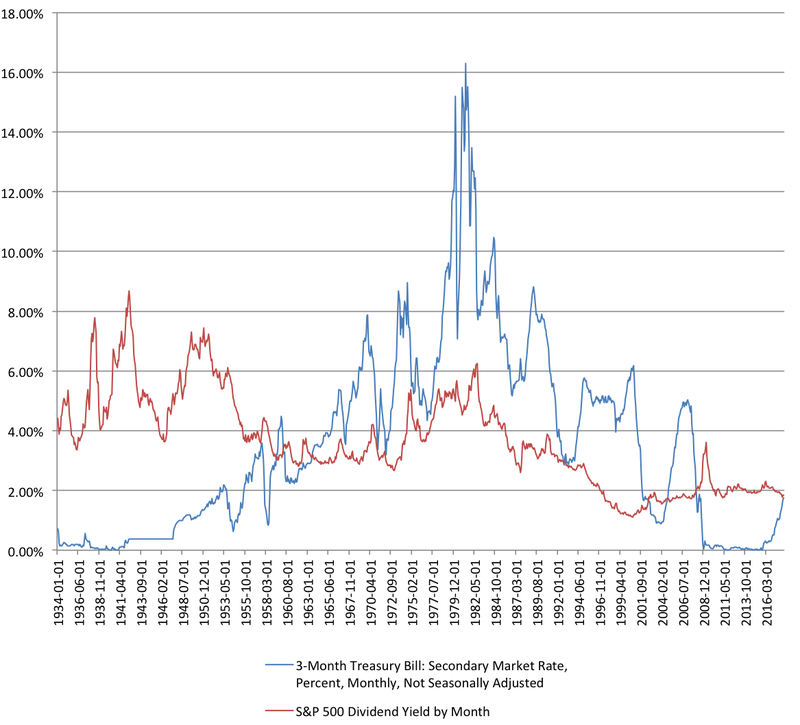 Today, though, there is evidence that change is afoot, as the yield on "cash" (short term Treasuries) now exceeds the dividends on a broad range of stocks (the S&P 500). 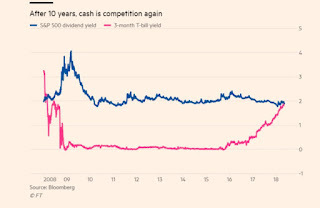 The Financial Times' graph, courtesy of John Authers, is on the right. I extended the graph back a bit (to 1933) just to get a longer perspective, via FRED and multpl. For about a thirty year period, dividends were generally always higher, until some point in June of 1963, when the rule flipped. 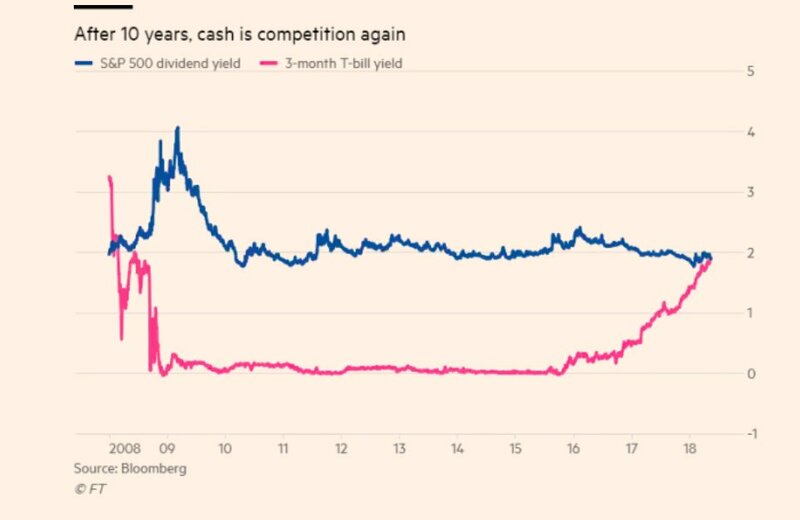 Cash was king, more or less constantly, for the following ~2,335 weeks, until February of 2008. There are periods where these two measures briefly "invert" from the norm in both eras (e.g. 1959 for dividends, 2002 for cash), but it's unusual. What does it mean? Stanford economist Bob Hall (who continues as chairman of the academic panel that dates American business cycles) notes that, economic syncopation being what it is, “[t]he next recession will come out of the blue ... just like all of its predecessors.” However, the Economist has pointed out previously that this economic cycle is already running exceptionally long at ~105 months, and it is now more than a year past the average of the last three (the longest ever, March of 91-March 01, was 120 months). Meanwhile, valuations continue to be particularly rich (the Shiller PE is at 32.33, in excess of the '29 crash and only matched by the dot-com bubble). My sense is that the financial columnists pointing to this data are wondering how "out of the blue" a contraction could be at this point. Which is an interesting point to consider, when one reflects on the power of narratives in financial markets.